Just add water to Glob Natural Color Blends and voila, you have safe, non-toxic, biodegradable paint! Each pigment is botanically crafted from natural colors found in vegetables, fruits, flowers, herbs, roots and spices — for example, basil makes green and pomegranate makes reddish orange — and you won’t find any petrochemicals, VOCs or other toxins inside. The vegan formulas use cosmetic and food grade ingredients, and the vibrant color blends that round out the Glob collection are: Lemon Verbena, Tangerine, Berry Blue, and Plum Purple. If you’d rather not mix your own pigments, Glob Ready to Use Botanical Paints will be available March 15. Just add water to Glob Natural Color Blends and voila, you have safe, non-toxic, biodegradable paint! 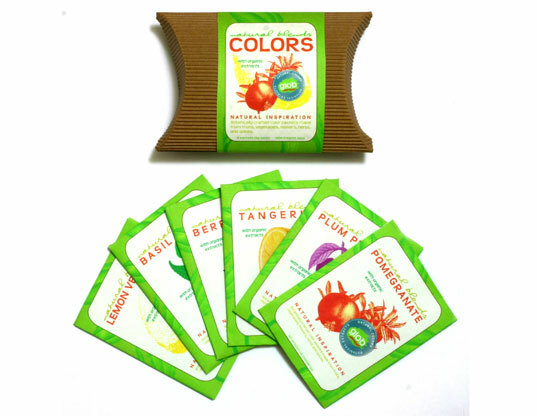 Each pigment is botanically crafted from natural colors found in vegetables, fruits, flowers, herbs, roots and spices -- for example, basil makes green and pomegranate makes reddish orange -- and you won't find any petrochemicals, VOCs or other toxins inside. The vegan formulas use cosmetic and food grade ingredients, and the vibrant color blends that round out the Glob collection are: Lemon Verbena, Tangerine, Berry Blue, and Plum Purple. If you'd rather not mix your own pigments, Glob Ready to Use Botanical Paints will be available March 15.